If you were following our blog last week you would have read our post A Beginner’s Guide to Successful Marketing Campaigns, which —you guessed it— was packed with tips on effective email marketing strategies. In the post, we also promised an upcoming blog about the best and worst times to send emails. Here it is! When we first began sending emails to our subscribers, we first had to figure out the best day and best time to send emails. Just in the same way a café may have a morning or lunch rush hour, there’s also a ‘rush hour’ when people are more likely to get on their phones or laptops. Finding that sweet spot brought just the benefits we hoped for: we’re able to ensure that we achieve a high rate of emails opened, and then click-through to our site. This generates high traffic, which in turn, can generate sales. It sounds so simple, and it is! It’s just a matter of figuring out that first step. But first, let’s get to the roots. It’s no secret that your email subscribers are your most loyal audience. They have the most incentive and the ability to share your content. Once it is sent, this sharing creates more traffic, more subscribers, and more customers. Combining timing with a healthy subscriber list ensures your site sees all of these benefits and more. It’s a snowball effect of success. Your email marketing campaign is ready to launch! Your subject line is attention-grabbing, your content is interesting, your offer is compelling, your email is beautifully designed. You’re set up for success, right? Only if it were that easy!. All of your hard work has the potential of falling flat if your timing happens to be off. The quest of getting your subscribers to open your emails relies largely on this. But don’t fear, as we’ve been there too and we’re here to figure it out with you. The first key tip I have to share is don’t forget about time zones. To solve the time zone issue, you can either choose to send emails based on the most important time zone or segment your subscribers lists. We talked about this a bit more in our post The Best and Worst Times to Post on Social Media previously. It can be so easy to forget that if you schedule your email to be sent out at 10am on Tuesday your time, your recipients may instead receive it at 2am on a Monday their time. Oops! We tackle this by using Aweber to create a breakdown list by time zone. We’re able to categorize our subscribers to ensure that they receive our emails at the same time, no matter where they are in the world. Don’t fear if your mailing service doesn’t offer this feature. 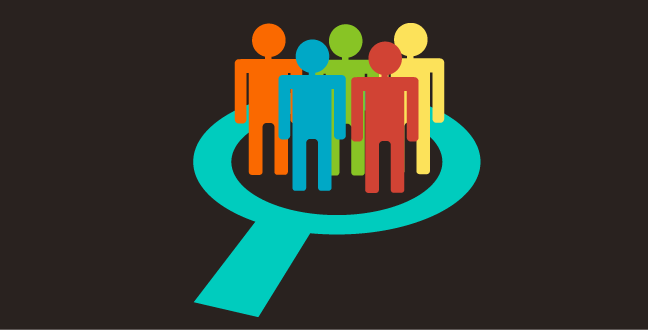 You can instead look at your data to see where the majority of your audience is based. If your company is based locally, go with your own time zone. However, if your audience is a global one then target the time zone of most of your subscribers (Aweber also tracks this for us, as many other mailing services will do too). For instance, if your audience is in the US, target the Eastern Time Zone, as this includes nearly 50% of the population, which is the highest population concentration in a single US time zone. Campaign success, as always, depends on the audience. 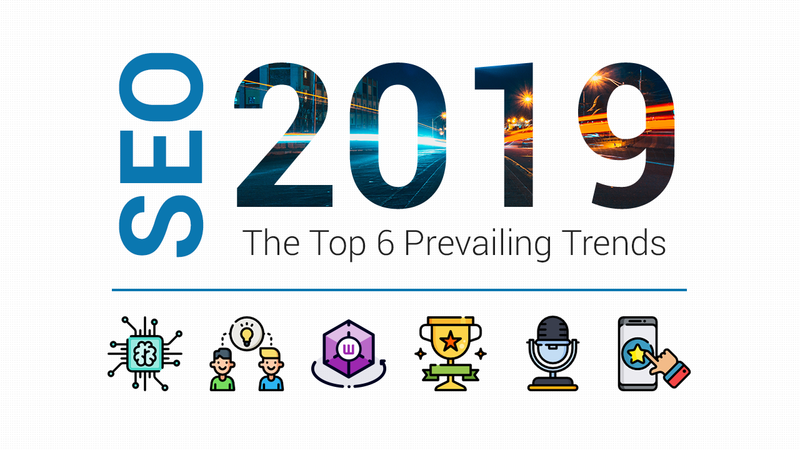 Understanding the demographic of our audience has helped us shape the content and direction of our work here at SEOPressor. 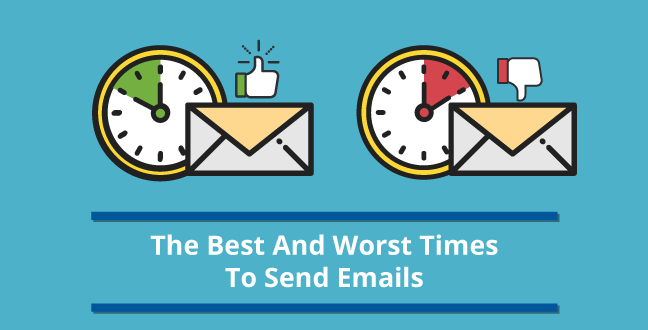 It’s also the driving force in working out the best and worst times to send emails. Do your emails attract young professionals, or older, more experienced business people? Knowing this will help give you a general idea of their schedule and when they are most likely to scroll through their phones. For example, sending an email on a Saturday evening will be less effective with a younger crowd, who may be out until late at night, heading home without checking their email. In the same way, sending out your email on a weekend morning may not effectively reach subscribers with children, who may take Saturdays and Sundays out as the time to spend with their families. So, it’s not only about the content, it’s about the audience too! Research taken from 10 studies have proven that Tuesday is the best day to send email out into the world. The studies show that the highest email open rates happen on Tuesdays, which we know then leads to more click-through and higher site traffic. 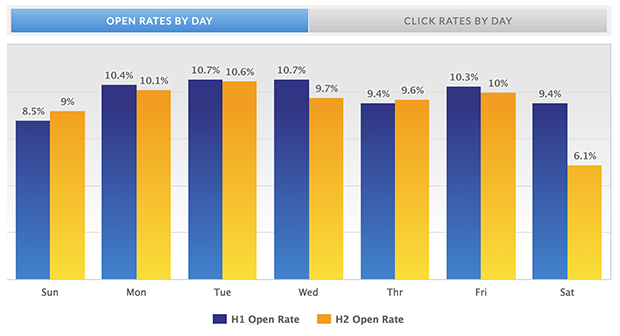 The next highest open rate is shown to be on a Thursday. If you’re aiming to send two emails per week, we’d recommend choosing Tuesday as your first day, and Thursday as the second. None of the ten studies showed that Wednesdays were the most successful day to send email, but it did come in at second a few times. Be sure not to overload your subscribers’ inboxes by sending them emails two days in a row! Flooding their inboxes could create the opposite effect, and you may see no clickthroughs at all. So, if you do choose Wednesday as your day to schedule your emails, try to avoid sending again on Tuesdays or Thursdays. On the other hand, Hubspot’s report revealed that Monday, Tuesday and Wednesday had the most email opens. The worst days for open rates were weekends for majority of the businesses, hands down. The verdict: Best days to send are on weekdays. Do keep in mind that despite these statistics, a lot of this can be subjective. We’ve found it’s best to base our email schedule on what works best for our clients. 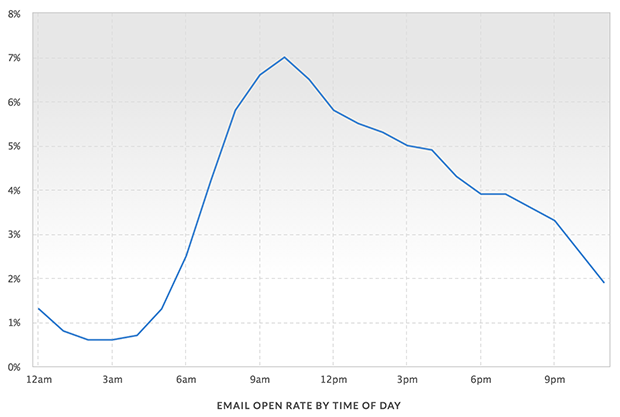 For instance, the data we gather from Aweber shows us that our email opens have a great success rate on Saturdays and Sundays, which isn’t always common. I’ll get to that in a little bit in our Weekend Warriors section below. But first, let’s see what the best time to send email marketing campaigns is. This can be tricky, with many more options for effective time slots. What we’ve found helps is thinking of when our subscribers may be most likely to have the time to browse on their phones. Seeing which is the best time of day to send email is especially important because data shows that the most email opens are likely to happen within the first hour of your mail being sent! This percentage continues to drop off after this first hour, so making sure you choose a productive hour is your key to success. Mornings are definitely a great time. People are checking their phones first thing after waking up, or on their commute to work, perhaps with a cup of coffee in hand while getting up to date for the day. The first peak, not so surprisingly, is at 6am. This is likely to be because of the statistic that indicates a whopping 50% of people begin their work day by checking their emails in bed. If your audiences are workaholics, 6am might be the perfect time for your email to land in their inboxes. 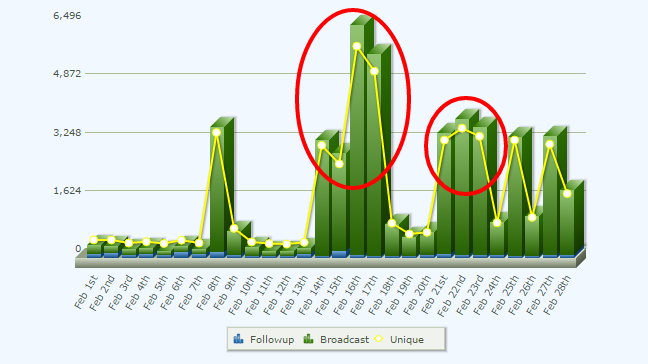 There’s also high success between 9am and 11am, with a spike at 10am. If your subscribers are likely to be settling in at work and getting up to date online at 10am, this could be the optimum time for you. There’s another peak in the afternoon at 2pm, when people have finished lunch and are looking forward to finishing work. If a majority of your subscribers are office workers, this could be a great time to schedule your email. Another high success rate occurs in the evenings, from 8pm to midnight. Guilty as charged, — I often check my emails again right before bed. With so many internet distractions these days, many people like to try and keep their mornings open for productivity, and will avoid marketing emails in the mornings. The evening then becomes the perfect time to check their inboxes for other, non-work related emails. The verdict: Most people tend to open their emails in the morning, especially on business days. This is what we have learned as we’ve gone along, and hopefully will give you, even more insights into the best and worst times to send emails. We all know this feeling! After a weekend off, catching up with friends, or simply staying in pajamas for 48 hours, it’s hard to get revved up for a week ahead of work. For this reason, Mondays are generally considered to be the worst day you can send your marketing emails or newsletters. This is because people are often more likely to arrive at work, open their inboxes, and delete whatever seems like spam or unimportant emails. So, test and configure the best time to send business email as it differs for everyone. This can be a tricky one, depending on your business and your audience. While internet activity does generally reduce on Saturdays and Sundays, some people also have more free time to check their inboxes. This again is entirely based on your readers. As mentioned earlier, if the majority of your readers are full-time professionals who have children, they may be taking the weekend out to spend time with their families. However, if the majority of your subscribers are young professionals or people without children, then you’ll see the rate of success of email opens increased. Our own success in weekend opens and clickthroughs may also lie in the fact of how internet-based we are at SEOPressor. As many businesses will close and not send emails on the weekend, this gives us a great opportunity to get noticed in our subscribers’ inboxes. If this strategy sounds right for your audience and company, then weekends might be the ideal time for you. Without the flood of weekday emails, you’ll be right at the top. Although we do see a high open and click through rate on Saturdays and Sundays, our most successful email days do align with the data. Combining our past experiences with sending out emails with the information and data collected from the studies, we feel confident in saying that, Tuesdays, Wednesdays, and Thursdays are likely the most successful days for sending your email out to subscribers. I’ve found that so much in being successful in this industry really is about getting hands on and learning as you go. So I’m going to get real and show you some of the steps I take in figuring out my perfect formula. Step 1: Beginning with what the data tells me. 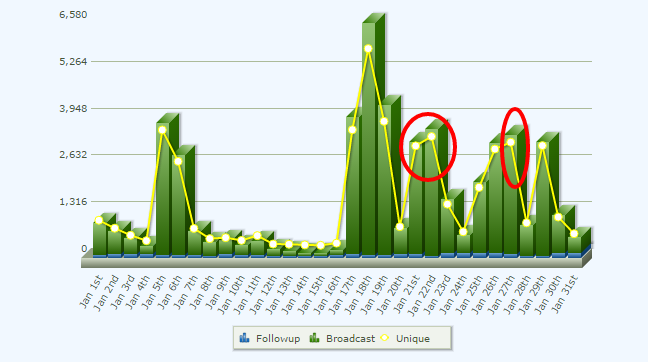 Tuesdays at 10am show the highest success? Ok! I’ll start with this and see if it’s the best day and time for me. Step 2: Checking my own data. I’m going to check with Aweber to see how many email opens and click-through my chosen time has given me. Step 3: Knowing there’s always room for improvement. If I’m not getting the email open rate I want to see, then I begin testing a few different times and days. Step 4: Keeping up with testing. I’ll keep monitoring my data with Aweber to work out where I’m seeing the most success, and continue to tweak my schedule based on this. Step 5: Making sure I understand my audience. Knowing my client base and demographic will help me tailor my email scheduling to their own schedules. What’s the most successful day you’ve had with email scheduling? I’d love to know what your experiences are with your own best and worst times to send emails. Let me know if you have any more handy tips to share in the comment section down below too! 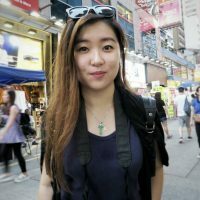 This post was originally written by Joanne Chong and published on March 31, 2018. It was most recently updated on July 27, 2018. Take your email marketing campaign to the next level today!